00:45 Good morning everyone and welcome to AUTOSPORT Live for blow-by-blow coverage of round 17 of the 2010 FIA Formula 1 world championship. 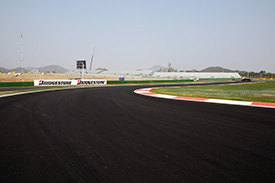 The Korean International Circuit is the newest venue in the calendar and the 5.621 km anti-clockwise course has been readied in double-quick time as an intense battle for the drivers' championship continues. A late inspection resulted in the race being given the all-clear by the FIA just 10 days ago and, since then, work has been frantic to ensure a safe and smooth running of the grand prix weekend. The final layer of asphalt was completed just two weeks ago and there is clear cause for concern over the nature of the track surface, but the drivers gave the new venue a resounding thumbs up yesterday. Their positive words will now be put to the test as the world waits for the first practice session at Yeongam. 00:46 Today, we will guide you through the opening practice sessions with minute-by-minute commentary as the teams and drivers begin their build-up to the race. Later, at 04:45 GMT, we will return for full coverage of the second practice session. AUTOSPORT Live will end the day with a detailed analysis of the impending rain and how it will shape the rest of the event, on the Korean Grand Prix Weather page. 00:47 Five drivers remain in the hunt for the big prize in the drivers championship with Australian Mark Webber still leading the title race by 14 points with just three rounds remaining. Fernando Alonso and Sebastian Vettel are both on top form and will be looking to cut that lead down before the Brazilian Grand Prix in two weeks time. Lewis Hamilton and Jenson Button have slipped back in the points standings over recent events and the British pair need a strong result here to avoid being cast out of the reckoning. Reliability is critical at this stage of the season, and none of the top five contenders can afford a DNF. Red Bull Racing holds a 45 point advantage over McLaren in the constructor's championship and the Milton Keynes-based outfit will be looking to at least maintain that gap at Yeongam this weekend. Ferrari isn't out of the battle just yet, but if the Scuderia fails to get both drivers on the podium on Sunday then there is no chance the title will be returning to Maranello. 00:49 We start this crucial round of the campaign with fine and dry weather conditions for the opening practice day. Early morning mist has cleared across south-west Korea as the sunshine burned it away. Both practice sessions are expected to take place with a good deal of sunshine around with partly cloudy skies from time to time. Temperatures remain pretty constant in Korea at this time of year and we expect a maximum of 22 Celsius this afternoon during the second session, while humidity will rise to a high 80 percent. 00:50 Keep up to speed with our minute-by-minute commentary on the move with the new AUTOSPORT app. 00:51 Motor racing fans love to debate the action on track and the live forum is your opportunity to share your experiences of the Formula 1 weekend with everyone. • How many spins will we see during this morning's first session? • Will the drivers manage to find decent grip today, or do you feel it will be a struggle all weekend? • Assuming the drivers are able to coplete laps without repeatedly falling off the road, who do you think has the package to be quick at Yeongam? 00:53 Never has there been a more likely piece of driver feedback set to reverberate through race engineers headsets throughout the pitlane over the next 15 minutes: "slippery" and "low grip." The drivers will take to the circuit for the first time this morning to explore a venue still coated with dust from the ongoing construction efforts and with some potential to find oils emanating from the still-fresh asphalt. Nevertheless, the grip level will evolve rapidly once some serious running begins and racing rubber binds into the surface for the first time. While a classic game of brinkmanship plays out in the early stages, we can expect a series of exploratory laps for the drivers to learn the all-new layout, while the leading contenders wait for the most representative track conditions to avoid taking too much out of the sole set of tyres allocated to the first session. 00:55 There are five minutes to go until the slipping and sliding begins at Yeongam. 00:57 Championship leader Mark Webber has his balaclava on and moves towards his car, as the world waits for the first session to begin. 00:57 Lewis Hamilton is already in the cockpit of his McLaren as he receives advice over the team radio. 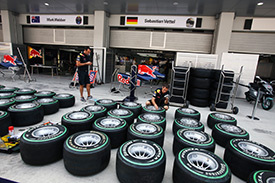 00:57 Final routine checks are made to the RB6 of Sebastian Vettel as he gets ready for action at the Yeongam circuit. 00:58 The focus on the championship contenders continues with Jenson Button, as the belts are tightened while he waits to go out. 00:59 The track temperature is up to 24 Celsius, as we move to within one minute of the start of the session. 00:59 Michael Schumacher climbs aboard his Mercedes as he looks forward to the session with a smile. 0 min: Heikki Kovalainen leads the cars out onto the Korean International Circuit for the first time. 0 min: Jaime Alguersuari and Sakon Yamamoto follow Kovalainen out onto the circuit. 1 min: Lewis Hamilton is also joining the early runners for an installation tour. 1 min: The bright sunshine makes the car is hard to identify as they come down the long straight towards Turn 3. 1 min: Sebastien Buemi, Bruno Senna and Tonio Liuzzi have all joined the racetrack as the installation lap continues. 3 min: Hamilton continues for a second tour to continue his learning of the circuit. 3 min: The drivers are understandably being very careful on this first lap around the circuit, as Alguersuari crosses the line to begin a second tour. 3 min: Adrian Sutil, Nico Hulkenberg and Mark Webber have all come out onto the circuit to check out the conditions. 4 min: Alguersuari continues round on his second lap at a sedate pace in the Toro Rosso. 4 min: Alguersuari reports on the team radio that the track is very dirty and really slippery. 4 min: Fernando Alonso is heading out for his first experience of the slippery Yeongam track. 5 min: Rubens Barrichello and Michael Schumacher have joined the racetrack, as Sebastian Vettel rolls out in the Red Bull. 5 min: Massa is also on track for his first laps around here in the Ferrari. 5 min: Alguersuari completes that lap in a time of 2m20.611s to post the first ever lap time at the Yeongam circuit. 6 min: Nico Rosberg is the last man out onto the track to check the conditions as Vettel continues on his installation lap. 7 min: The drivers are taking things extremely carefully in these opening minutes as Vettel returns to the pits. 7 min: Alguersuari completes his second lap in a time of 2m16.178s. 8 min: On-board with Alguersuari and it is clear that the Spaniard is braking really early and easing the Toro Rosso into each and every corner. 8 min: Unsurprisingly, the drivers report very slippery track conditions as they chat with the race engineers after completing the first laps here. 9 min: Alguersuari was just slowly coaxing the car into Turn 12 and almost ran out of road! The Spaniard was able to continue and has returned to the pits. 10 min: Down at Lotus, Jarno Trulli has told the team he has never driven on such a slippery track. 11 min: Michael Schumacher has clearly seen enough in the early stages and hatches a plan with his race engineer Andrew Shovlin to come back in a few minutes when conditions are better. 11 min: Many of the drivers are now out of their cars ahead of what could be a lengthy wait for further action. 12 min: Schumacher disappears out the back of the Mercedes garage and heads towards the team hospitality unit. 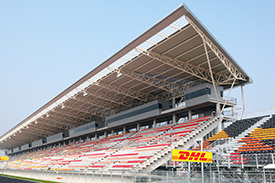 12 min: The track temperature is 25 Celsius in the morning sunshine. 12 min: Robert Kubica is heading back out for another tour in his Renault. 13 min: In the team garages the data download from the installation run is being completed, but it may be several minutes before we see meaningful running. 13 min: Kubica kicks up a huge cloud of dust as he gingerly brakes the Renault for Turn 4. 14 min: Petrov has joined his team-mate on track to continue the exploration. 14 min: The track condition is possibly even more difficult than the first day of practice at the Bahrain Grand Prix when Formula 1 first went there in 2004. 15 min: Kubica pits after a single lap. 15 min: It is clear that the drivers are extremely hesitant when applying any reasonable percentage of throttle, and even at slow speed the drivers are correcting slides frequently. 16 min: Petrov is also heading back to the garage, but Hamilton and Massa are out again. 16 min: Button is also heading around for another look at the circuit in his McLaren. 19 min: Massa is on course to clock a time and has set the fastest first sector at an epic 63.3 seconds. 19 min: The rest of the drivers are eagerly watching Massa's progress from the pits, while they wait to see what kind of lap time he can establish. 20 min: Massa elects to pit his Ferrari. 20 min: Sakon Yamamoto joins the circuit for the second time today. He is joined by Jaime Alguersuari. 21 min: Yamamoto climbs the hill exiting Turn 6 as he continues round on his lap out of the pits. 21 min: The Japanese driver exits the final corner and crosses the line to begin a timed lap. 23 min: Yamamoto brakes too late for Turn 3 and misses the apex of the right-hander by around four metres. He is able to continue. 23 min: Further around the lap and the Japanese driver is off the road completely exiting Turn 11. He rejoins with extremely dirty tyres. 25 min: Michael Schumacher and Sebastien Buemi have both joined the racetrack, while Alguersuari completes a timed lap with no improvement. 25 min: Hamilton is back out again in his McLaren as the team tries to get some aerodynamic work underway with back-to-back tests of developments. 26 min: Yamamoto lowers the benchmark to 2m01.026s as the pace improves. 27 min: Schumacher crosses the line in 1m53.458s and lowers the benchmark by 7.568 seconds. 27 min: Sebastien Buemi is the next man to top the list with a lap of 1m52.318s. 27 min: Hamilton tours through the pits to give McLaren a measure of the time loss during a pitstop. 28 min: Mark Webber is out on the circuit for a run in the Red Bull, as Yamamoto finds another five seconds with a lap of 2m00.013s. 28 min: Four drivers have completed a timed lap so far, with Buemi at the top, followed by Schumacher and Yamamoto in third. 29 min: Schumacher takes the top spot away from Buemi with a lap of 1m50.140s. 29 min: Buemi responds with a time of 1m50.876s but remains second to the German. 29 min: Kobayashi has emerged from the Sauber garage for an exploratory tour. 30 min: Sebastian Vettel is watching the progress of the drivers from the Red Bull garage, as Mark Webber goes quickest with a lap of 1m49.308s. 30 min: Bruno Senna joins the racetrack for a run of laps in the HRT as Schumacher returns to the pits at the end of his first run. 31 min: Webber is continuing round on another hot lap but it is visibly hard work for the Australian as he corrects the car at every corner. 32 min: Webber catches traffic in the form of Yamamoto through the twisty section of circuit and is unable to force his way past the Japanese driver. 32 min: While the track will evolve throughout the session, these conditions will quickly punish the sole set of tyres allocated to each driver. 33 min: Kobayashi has joined the early order with the fourth fastest time in his Sauber. 33 min: Webber is quickest of the six drivers to have posted a time so far, with Buemi second, Schumacher third, Kobayashi fourth and Yamamoto fifth. 33 min: Williams drivers Hulkenberg and Barrichello join the racetrack for a run of laps. 34 min: Webber finds another full second on his way to a time of 1m48.229s. 34 min: Massa is heading out to test his Ferrari without an F-duct blown rear wing. 35 min: Sebastien Buemi improves with a time of 1m48.648s and is now just 0.413 seconds behind pacesetter Webber. 36 min: Webber himself improves and lowers the benchmark to 1m45.723s as we start to get down towards a sensible lap time. 36 min: Massa begins a lap against the clock in his Ferrari. 37 min: Hulkenberg goes fifth for Williams with a lap of 1m51.372s and his team-mate Barrichello slots into sixth position. 38 min: Massa is fighting for grip all the way around his tour, completing a lap despite a bounce over the run-off on the run back towards the pits. 38 min: Barrichello moves up to fourth position in the Williams with a lap 1m48.854s and is now just over 3.1 seconds off Webber's benchmark. 39 min: Hulkenberg is again quicker than his team-mate, and moves up to third place with a time of 1m47.755s. 39 min: Massa has also been checking out the run-off at Turn 1 after a major wobble under braking for the first corner. 39 min: Michael Schumacher is back out on the circuit for another run of laps in the Mercedes as Webber lowers the target time to 1m44.837s. 40 min: Kobayashi is now up to second quickest in the early times as grip levels continue to slowly improve. 40 min: This is a productive run of laps for Mark Webber and he is gaining invaluable data for the Red Bull team. 41 min: Force India drivers Liuzzi and Sutil come out onto the circuit to begin their programme of work. 41 min: The McLaren pair continue to preserve their rubber for later in the session by completing a number of slow installation laps. 41 min: Webber crosses the line but is unable to improve on his fastest lap on this occasion. He is 1.983 seconds ahead of Kobayashi. 42 min: Nico Hulkenberg posts 1m45.910s and moves up to second position behind Webber. 42 min: Massa is now sixth after finally completing a clean lap. Unsurprisingly, he tells engineer Rob Smedley that the surface is very slippery. 42 min: Michael Schumacher is also on the move and he is up to third position in the Mercedes after a lap of 1m46.679s. 43 min: We are almost halfway through the first practice session, as Mark Webber pits to bring a nine lap run to an end. 44 min: Webber is quickest with a lap time of 1m44.837s with Hulkenberg second, Schumacher third, Kobayashi fourth and Buemi fifth. 44 min: Adrian Sutil slots into eighth position with his first timed lap of the weekend. The German manages 1m50.003s. 45 min: Petrov is touring slowly as he looks for space to begin a timed lap. 45 min: His team-mate Tonio Liuzzi is 10th after clocking 1m50.736s. 45 min: Nico Rosberg joins the circuit in the Mercedes. The German has yet to post a time on the board. 45 min: Massa is now up to fifth quickest in his Ferrari with 1m47.473s. 46 min: Nico Hulkenberg is now going very quickly in the Williams ... and he takes the fastest time with a lap of 1m44.509s. 46 min: Hulkenberg beats Webber's previous benchmark by 0.328 seconds. 47 min: Alonso is now out for his first proper run in the Ferrari, taking advantage of the ever-increasing grip level with a late start. 47 min: Rosberg is now halfway through his first timed lap of the weekend and is so far taking things calmly and sensibly. 48 min: Hulkenberg returns to the pits following that short run of laps that saw him take the fastest time away from Mark Webber. 48 min: Rosberg rounds the final corner and drives for the line. He completes the lap in 1m49.951s to go 10th. 49 min: Kobayashi, spectacular as ever, gets it slightly wrong in the tricky pit entry by taking to the grass. 49 min: Alonso starts his day with the 11th quickest time of 1m49.413s. 49 min: Tonio Liuzzi produces 1m46.546s to go fourth in the Force India behind Hulkenberg, Webber and Barrichello. 50 min: Adrian Sutil takes fourth position away from his team-mate with a lap of 1m46.442s as Force India makes its mark on the classification. 51 min: Rosberg is up to eighth in the Mercedes after posting an improvement of 1m47.019s. He is now just four-tenths of a second down on team-mate Schumacher. 51 min: Alonso improves to 10th quickest with his second flyer, kicking up the ever-present dust at the Turn 18 kink onto the pit straight. 51 min: Sebastian Vettel is now on the circuit for Red Bull Racing. He crosses the line to go 13th. 52 min: Petrov has clocked the fastest first sector at 55.5 seconds. 52 min: Hulkenberg leads the pack with Webber in second and Barrichello third. All three drivers are in the pits making set-up changes. 53 min: Vettel is set to improve on this lap as he comes through the twisty section of circuit and drives towards the start-finish line. 53 min: The German posts 1m45.999s and moves up into fifth place. 53 min: Button is now out for what McLaren describe as a baseline run. 54 min: Alonso has been off for a dusty excursion at Turn 11 but is back underway. 54 min: Michael Schumacher is currently third and is back out on the circuit for another run of laps. 55 min: Glock has topped the new-team stakes with a run for 15th quickest at this stage. 55 min: Red Bull is back on top, but this time in the form of Sebastian Vettel as he posts 1m44.404s. 55 min: Button goes 10th quickest with his first real effort of 1m46.775s. 56 min: Schumacher is quickly back into the pits after a very short run on the circuit. He is now fifth in the standings. 57 min: Vettel lowers the benchmark time still further with a lap of 1m43.599s. 57 min: Kubica clocks his first time with a 1m48.979s, leaving Hamilton as the only man still to put a time on the board. 57 min: Button springs up to second quickest with a 1m44.367s effort in the McLaren. 58 min: Petrov and Heidfeld are also on the move up the order, taking fifth and sixth quickest. 59 min: Petrov moves up further to fourth with the fastest first sector, somewhere the Renault may be strong with its efficient F-duct. 59 min: Kubica, meanwhile, has repeated Massa's trick at Turn 1, getting the Renault out of shape under braking after clouting the kerb awkwardly. 60 min: Button has now taken the fastest time through the first sector as he tests McLaren's revised F-duct rear wing. 60 min: Button tops the times for McLaren with a 1m43.096s. 61 min: Vettel crosses the line a few seconds behind Button on the road, but is unable to improve on his time. He is now second to the British driver. 62 min: Nico Hulkenberg has slipped to fourth position in the classification, but the Williams driver is now back out on the circuit for another run of laps. 62 min: Button has, however, joined the long list of drivers having bounced off the circuit, resuming with a hefty load of dust on his tyres. 63 min: The Williams drivers are running in tandem as eighth placed Barrichello also rejoins the track to continue learning the Yeongam circuit. 63 min: Jaime Alguersuari improves with a lap time of 1m46.519s to go 13th for Toro Rosso. 64 min: Tonio Liuzzi crosses the line in 1m46.707s - just a shade slower than his best the lap so far. He remains in 14th position. 65 min: Michael Schumacher is back out on track for what will be his third run of laps in the Mercedes. He is eighth in the classification. 66 min: Hulkenberg is running extremely quickly on the circuit, and he crosses the line to move up to third position with a lap of 1m44.043s. 66 min: Kubica moves up the order with a 1m44.374s to take fifth quickest. 67 min: Mark Webber is back out on track but Bruno Senna has stopped in the HRT with a damaged left rear suspension. 68 min: Replays show that Senna spun at the quick downhill section at Turn 7 and his left rear wheel popped up into the air. 68 min: The HRT spun wildly across the asphalt run-off area and the Brazilian came to rest without making it as far as the barriers. 69 min: Senna has climbed out of the car as the marshals move in to retrieve the HRT, as we see the damage to the left rear suspension. 70 min: That quick section of circuit remains under the control of yellow flags, as a tractor unit arrives to move the HRT away from the run-off area. 70 min: Hamilton is still yet to set a time in his McLaren and the team are busy switching aerodynamic parts at the rear of his car. 72 min: The local marshals are being aided by a team from Australia this weekend, but that recovery of Senna's car is taking some time. 72 min: The track is finally all clear as Senna's car is placed behind the barrier. 73 min: Rubens Barrichello posts the fastest first sector time on his latest lap, as his team-mate Hulkenberg sets the timing monitor alight in the second sector. 74 min: Hulkenberg goes quickest with a time of 1m42.678s as Barrichello follows him into second place. 74 min: Jarno Trulli is the slowest of those to have set a time and the Lotus team are trying to fix yet another gearbox problem for the Italian. 74 min: So it's all change at the top of the order with Williams drivers first and second with Button third and Kobayashi fourth. 75 min: Mark Webber moves up into fifth position with a lap of 1m43.414s. He is now just ahead of team-mate Vettel with Schumacher in seventh. 76 min: Schumacher is set to improve on this lap and he drives for the line ... he moves up to fourth with 1m43.149s. 76 min: Hulkenberg and Barrichello are immediately back into the pits in the pair of Williamses, having set pacesetting times. 76 min: The dust continues to fly at the apex of Turn 18, with a huge amount now spread across the track heading onto the pit straight. 77 min: Rosberg is up to fifth - one place behind Mercedes team-mate Schumacher, with a lap of 1m43.231s. 77 min: Adrian Sutil crosses the line in 1m44.794s and he moves up a place to 13th, as Senna watches the action from the side of the track. 78 min: Michael Schumacher returns to the pits following that recent effort that saw him move up to fourth position. 78 min: Massa improves to 11th quickest with a 1m44.310s effort on his 22nd tour. 78 min: Sebastien Buemi has improved to ninth position in the Toro Rosso. He is now 1.288 seconds behind Hulkenberg's benchmark time. 79 min: Hamilton is now heading out for a run on what are relatively fresh tyres, having completed only eight slow laps so far. 79 min: Rosberg is now on a potentially quicker lap but is trapped behind the Ferrari of Felipe Massa. Nonetheless he goes fastest with 1m42.532s. 81 min: Ferrari reports a lot of graining on Massa's tyres after the Brazilian wrapped up his long run. 82 min: Hamilton sets his first time at a 1m47.336s, having followed Yamamoto's HRT for much of the lap. 82 min: Vettel moves up to fifth position in the Red Bull RB6 after clocking 1m42.988s. He is the only Red Bull driver in the top five. 83 min: Alonso takes 10th quickest with a 1m43.928s effort. 83 min: Sebastien Buemi improves his time, but is now in 11th position in the Toro Rosso following recent improvements from others. 84 min: Sebastian Vettel was on a very quick lap in the Red Bull, but was trapped behind Sakon Yamamoto in the final corner. 84 min: Hamilton has a clear track this time and moves up further to 16th. Both McLaren drivers are using the rear wing first tested at Suzuka. 85 min: Vettel set the fastest second sector time, but was unable to pass the HRT and therefore failed to improve on fifth. 85 min: Hamilton is on for a much better time now as he sets the fastest first sector. 86 min: Hamilton tops the order with a 1m42.208s but is immediately beaten by team-mate Button with his new benchmark of 1m41.940s. 86 min: Williams drivers Hulkenberg and Barrichello come out for a final run with just under four minutes to go. 87 min: Kubica springs up to second quickest in his Renault, just a fraction off Button's time. 87 min: Adrian Sutil improves from 16th to 13th in the classification with a lap of 1m43.602s. 88 min: Vettel again catches traffic in the final sector of the lap after posting a personal best in the first section. He has now slipped to eighth in the standings. 88 min: Almost all the drivers are on track for a final run with times still improving with the grip levels. 89 min: Hamilton clocks a big improvement, taking a further second out of the benchmark with a 1m40.887s. 90 min: Mark Webber is on the circuit but he runs wide on his latest attempt at a lap time. He remains down in 10th position. 90 min: The flag is out on the first session at Yeongam. 02:31 Kubica continues his strong form at the end of this session and is just a fraction off Hamilton's time with a 1m40.968s. 02:31 Michael Schumacher posts his best lap on his final attempt of the morning to go fourth with 1m42.022s. 02:31 Vettel improves to fourth position on his final effort after posting a time of 1m41.371s. 02:32 Graining continues to be a watchword in the pitlane, with the tyres working hard to scrabble for grip on this slippery circuit. 02:32 Lewis Hamilton is quickest for McLaren at the end of the first ever Formula 1 practice session at the Korean International Circuit. 02:33 Hamilton's time was 1m40.887s, ahead of Kubica in second and Rosberg third. Sebastian Vettel was fourth for Red Bull. 02:34 Jenson Button was fifth in the second McLaren, exactly one second down on team-mate Hamilton with Schumacher in sixth. 02:35 Mark Webber finished the morning session in seventh with Heidfeld eighth, Hulkenberg ninth and Barrichello rounding out the top 10. 02:35 Timo Glock took the new team honours for Virgin Racing in 19th with a lap 4.701 seconds down on Hamilton's benchmark time. 02:37 Schumacher and Massa completed the most running of the new circuit this morning. Both drivers completed 25 laps. 02:39 So first practice ends with Lewis Hamilton on top after a difficult and slippery first practice session at the Yeongam circuit. 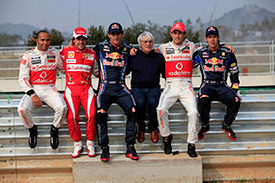 The drivers did an impressive job after much talk about the track surface in the build-up to the event. Will that continue as they push a little harder in the second session this afternoon? Join us at 04:45 GMT for more action from Korea.